Sigvaris Soft Opaque thigh high compression stocking for women is great for everyday wear, with a soft and durable material that provides graduated medical compression. This fashionable opaque stocking looks great and the graduated compression increases blood flow to your legs to help you feel less tired. The stocking is composed of a very soft, double-knit microfiber yarn, giving you full medical efficacy without compromising comfort. The option toe option gives you the freedom to wear various shoe styles with comfort. Choose your size. You may need to take a measurements to get your size. 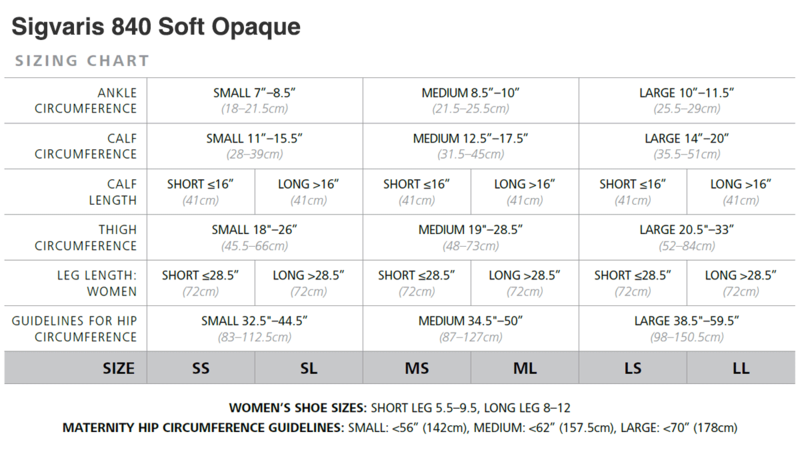 With your leg measurements, look up your size in the sizing chart in the images, or check out the Sigvaris Sizing Chart in a PDF.